Determining fault and liability for accidents involving 18-wheelers can prove difficult for victims in Texas who are seeking compensation for their injuries and damages. Evidence must clearly depict the truck driver or trucking company as the one responsible for the accident and all resulting injuries to satisfy the burden of proof in court. Victims can acquire legal representation to adequately present their case to the judge or jury. Lawyers use their skills and expertise to present the case to the courts using evidence that proves the responsible party needs to compensate the victim. In addition, lawyers work hard to maximize the victim’s compensation package by clearly depicting all losses caused by the accident. Federal laws established by the US Department of Transportation and Federal Motor Carrier Safety Administration, or FMCSA, govern how drivers and trucking companies must operate on public roads. Texas courts may find truck drivers or trucking companies that fail to operate within the federal guidelines negligent and, therefore, responsible for the damages caused by the accident. The judge or jury must first hear all circumstances of the accident and see evidence proving the claims to make an accurate determination of fault. 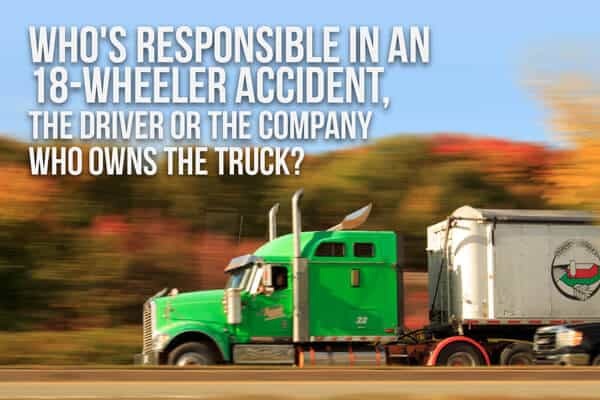 Before determining whether the truck driver or representative company is responsible for the accident, the courts must determine which driver was at fault for the collision. The exact circumstances of the collision come into play as the courts work to determine the correct fault assignment. The actions of both drivers will be evaluated to accurately determine the factors that lead to the crash. The judge or jury may look at speeding, distracted driving, and other forms of negligent driving as the main cause of the accident, especially when no other causes can be found. After analyzing all of the factors leading to the accident, the fault assignment is given in the form of a percentage. Any fault assigned to the truck driver could be passed onto the trucking company as well in the form of vicarious liability designation used by the courts. To prove this claim, lawyers must provide evidence that the trucking company acted negligently in hiring the driver, setting schedules, securing loads transported by their team, or other actions. Texas trucking companies are responsible for the drivers they hire and the training each one receives before getting behind the wheel of a big rig. Drivers of tractor trailers need to have their commercial trucking license to operate a fully-loaded vehicle of that size legally. Additional certifications may be required to transport hazardous materials or oversized loads. In addition, trucking companies must adhere to strict hours of service rules created and enforced by the FMCSA. Drivers must only operate their 18-wheeler for the maximum consecutive hourly limits for the day and week with mandated rest breaks along the way. If trucking companies do not abide by these regulations, the company may be responsible for the injuries and damages caused by their driver. The way the case is presented to the court can determine how the judge or jury assesses the evidence and facts. As a result, self-representation in court very rarely results in favorable outcomes and maximum compensation. Legal representation, on the other hand, gives victims the support they need to focus on recovery while seeking compensation for their damages. Attorneys present the case in court with a focus on assigning fault to the trucking company or truck driver. The evidence given to the judge and jury to review will prove the responsible party acted negligently and caused the 18-wheeler accident. The court will then hear the victim’s claims for compensation by assessing the value of past and future medical bills, lost wages, and property damage. The court must also assess the value of the victim’s pain and suffering using a court-mandated valuation procedure that is based on lifetime medical bill totals. A skilled lawyer will give the judge and jury the tools they need to accurately weigh every factor in an effort to make the victim whole after a serious accident occurs. If you were involved in a collision with a semi truck, or otherwise injured due to the negligence of another party, contact us at 817-864-9980 to schedule your free consultation. At Dashner Law Firm, we have over 20 years’ experience and help our valued clients receive the best result from their personal injury proceedings.